The trains to Kiev or any other Ukrainian destinations leave from station "Kievskaya". My dad livers practically in front of the that station, which was extremely convenient. We only had to cross the road and find the train. The lights were out and it was nearly midnight, so we had to look for our beds in the dark. With a little effort we've given the suitcases a place and waited until the train left Moscow. Despite the poor condition of the train we left right on time. After some time the lights went finally on and the female conductor began to distribute the bedding. 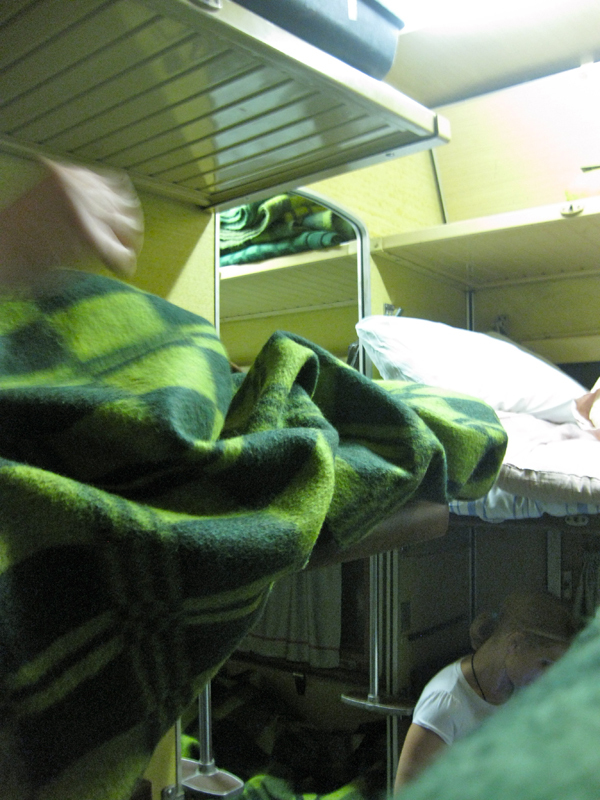 Sleeping and or traveling in the Russian trains is lovely. But it is important to prepare properly otherwise the journey will be less comfortable. We chose the third class because of the finances, but also because of the experience. We wanted to travel as the local people. The disadvantage is that you sleep in an open space and people nearby may be inadequate. Generally the fellow travelers are decent people. One time I had bad luck. I was traveling near a sick child and when I got home I also immediately became ill. This time we did not bother people, odor or noise. After I had made my bed, I had put on my comfortable, nice and warm clothes in which I could sleep. Besides the pleasant clothes, slippers were also very convenient to have. It gives you the opportunity to move freely through the train without taking the shoes off and on and off again. Cleansing wipes were a must, I felt fresh the entire trip. You get a towel along with the bedding, which is useful if you need to refresh yourself in the toilet. Take a compact bag for all the care routine stuff like toothbrush, hand soap and toilet paper. The toilet in the train was very dirty, but all my stuff on hand made my rituals easily and pleasant. We slept very well. But we were awakened for a passport control twice. Once when leaving Russia and again when entering Ukraine. We left Russia in the autumnal cold, but in Ukraine it was still summer. When we woke up it was already sunny and warm. The conductor sells tea and serves it in the typical Russian cup holders. In Moscow we bought some snacks which we had for breakfast together with the train tea. The train arrived right on time in Kiev. The metro is very close to the train station exit. We bought coins and went looking for our apartment.